For many occasional wine drinkers Zweigelt is probably a word they've never heard before (although it is also referred to as Rotburger). It's not a big name varietal like Cabernet Sauvignon or Merlot. Nope, this is Zweigelt straight out of the Burgenland Region of Austria. Zweigelt is a newer varietal, and a cross between St. Laurent and Blaufrankisch. Both of which are still not super popular wines in North America, themselves, but in Austria Zweigelt is the most widely-grown red variety! It's weird that you don't hear much about Austrian wines in America. They tend to get overshadowed by the popular Italian, French, and Californian wines, which is unfortunate. There are a lot of great wines out there in the world! 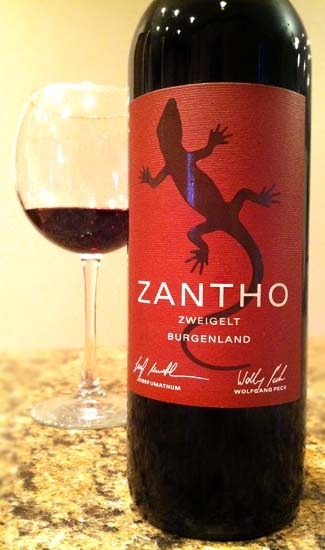 This is the 2010 Zantho Zweigelt wine which pours a dark garnet and has good legs. The aromas are of cranberry, cherry, and a hint of pepper. Tasting brings soft notes of pomegranate, cranberry, bay leaf, warm baking spices, a touch of dust with nice, gentle tannins. On a side note, this bottle comes with neat glass stopper instead of a cork. Very cool. Drink This: if you want to try Austria's most popular red variety. Like I said, it's a lot like a Pinot Noir but with some notes found in Gamay and Chianti. If you like any of those, you're going to like this one. Don't Drink This: if you want a big, burly wine. Zweigelt is rather elegant and soft. I could see it being a little overpowered by spicy barbecued meats and the like. Go check out Austrian Wine USA's Facebook page here. Very helpful, I bought a few bottles of another Zweigelt based on a tasting at my local liquor store - I wasn't sure what I had purchased, this is the most helpful description I could find. Cheers!